← Working with builders at Zeniths Open House. With Charlie after the dinner. At the dinner, Charlie presented the award, and I was caught competely off guard. Several friends later said it might have been the first time they had seen me at a loss for words. The EAA considers the award for up to five members a year who have given long service to fellow members. While it means a lot that the EAA approved my award, it was very moving to have been in a room with several hundred builders and fellow industry people and have them stand and applaud. I have worked a lot of years with little evidence that anyone beyond the immediate Corvair Community understood what I was trying to share or how important it was to me. The moment it was presented was strong proof that people in the larger home built community did understand. Here is the main reason why the award was a surprise; As a harsh self-critic, I can offer plenty of evidence that I don’t deserve it. People who have never met me often think I must be an opinionated know it all. Nothing could be further from the truth. I spend many quiet hours working alone everyday, and I spend a portion of it rexamining my perspectives and actions, and I am much more inclined to question myself than validate any opinion or action I have held or taken. If I have a sole redeeming quality, it is that I still have doubt, even when friends around me support and agree with me. That isn’t false modesty, it is just an awareness that comes from learning that the largest mistakes I made in life happened when I had the least doubt about which path to take. I have many people in my life to thank for the success I have had. This ranges from builders who offered a positive and fair review of our efforts to my wife Grace Ellen who has shared 17 years of triumphs of great days and tragedies of the loss of friends, all with a resilance that asked a great deal of a very sensitive person. It is my greatest fortune to have been born to my parents. There is no day where I feel I have lived up to the opportunity provided by simply being their son. 19 hours after driving away from the Zenith factory, we arrived back in our little town in Florida. The first stop I made was in front of the post office, where I carefully wrapped up the award and mailed it to my parents home in New Jersey. Walking outside, I paused for sometime in the shade to consider just how little my life would have been without them. The thought was more humbling than being presented with the award. 47 Responses to EAA Major Achievement Award. Congratulations William! Very much deserved. Sorry I was not there to enjoy the moment. That is awesome, and certainly earned! Yay! You deserve it in spades!! Woohoo! Plus the haircut looks awesome (makes you look even more youthful) Now when a critic or idiot becomes a burr under your saddle blanket, you can look at the plaque and say, “oh, well….” Very glad for you! Congratulations. That is an award to be quite proud of and I am glad too see giving credit to your parents for helping you achieve your goals. Congratulations! Many of our lives have been enriched for the better because of your work in the Corvair Movement. Congratulations William! 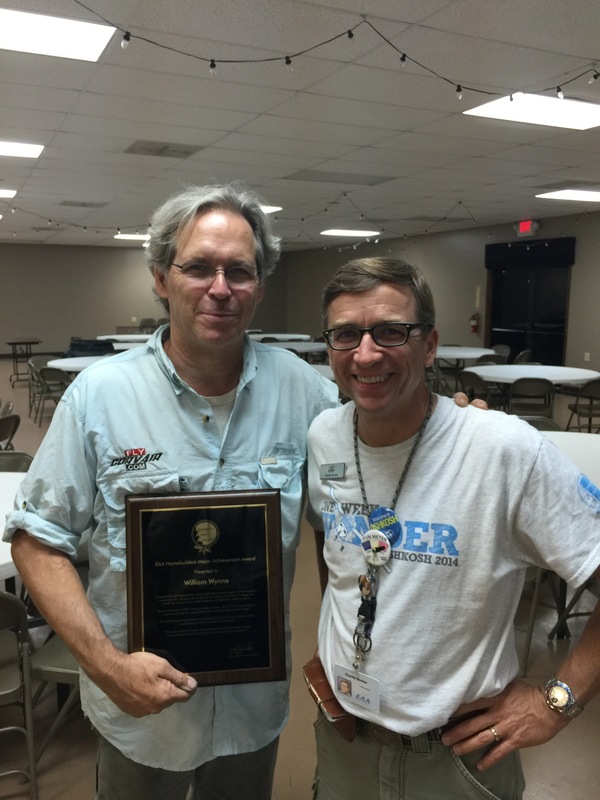 What a fitting award for someone who has dedicated his vocation to the advancement of EAA’s founding principles. Even if I never fly behind the Corvair that I’ve started I will always be indebted to you for sharing your knowledge and perspectives – not just on engines and aviation but on the larger meaning of relationships and life in general. Thanks again for all you do to advance experimental aviation. Congratulations William! I know that you father is proud. It’s not about the plaque. It’s all about your journey and the foundation that your parents provided. You are an inspiration to many and a refreshing change in a world full of “experts”! Keep loving life and thanks for sharing the journey! Congratulations, William. See, there actually are people out there that appreciate what you have done, and are doing! Hope the recognition of the award makes your journey a little more pleasant. And, you look okay with the haircut, really. Congratulations William, very pleased to see a little outside recognition for your accomplishments, not to mention efforts. Nice haircut too. Looking forward to seeing you in November. Just wanted to send you a short note. Can’t think of anything that hasn’t already been said. Thank you for your hard work and inspiration to guys like me who seek an affordable and reliable alternative engine. You certainly have the ability to do something else, but luckily for us you continue to stick with the Corvair. You certainly deserve the award !!!! Congratulations on an award well deserved! I would not be this far into my project without your help and guidance on my choice of powerplant the Corvair! Wish I was there to watch! Congratulations William it is a well deserved award for you. Sorry I couldn’t be there this year to see speechless. Outstanding! Congratulations. I wish we could’ve been there. Congratulations, William! You earned it, and we all benefit from your efforts. I think that is a honor well deserved. On a less serious note ; William Wynne speechless? Any evidence to support that claim? LOL! I am very glad to hear that you received that award. Stay humble. Keep plowing straight ahead! I can’t think of a single person in home built aviation that deserves this award more than you!!! Congratulations William!!!!! Serendipity. For the decade I have been attempting to be a homebuilder, no single person in the community has moved my progress along quite like you have. A well-deserved honor can be described as; receiving an award from organization all while you are pointing out the sometimes glaring faults and disconnects of said organization. As a member of that organization: cheers…William…cheers! well deserved! Congratulations of course, William. Sending the plaque on to share with your parents says it best I think. Well done William, you deserve it! Well done William, So well deserved, Congratulations!!! Congratulations William,it’s good to see you finally get the recognition from the eaa you deserve.your work and support are the reason I’m about to put my second Corvair powered plane in the air. Looking forward to flying it down to say hello sometime. Congratulations William, the award is well deserved! Congratulations William. Haters are gonna hate, but that doesn’t stop you from giving it your all. I really appreciate all you have done for me and the whole homebuilt community. Few know how hard you’ve worked all these years. Congratulations and well deserved. I admire your intelligence and humility, which is a combination that is tops in my book. May God continue to bless your work. Congratulations William. Your knowledge and research on the Corvair Flight Engine is only surpassed by your generosity to share this knowledge with others. Congrats once again. Recognition is deserved and Charlie has once again renewed my faith in the EAA. Haircut looks good. Have you seen the movie ‘Cool Running’? A story of a Jamaican bobsled team competing in the Winter Olympics. My favorite line is one in which I recall often and it applies to ever person alive. In the movie the reference was to a gold medal. John Candy was the protagonist in this movie (coaching the Jamaican team) and told the Jamaican bobsled team leader, who was so very desperate to win a gold medal…. ‘If your not man enough without it, you never will be with it”. In my humble opinion you never ‘needed’ this award…you are our teacher and mentor with or without it. You deserve this. Your efforts provide mass quantities of useful information. Your approach supplies not only the ‘How’ but the ‘Why’ it should be done a particular way. Without this, I think there would be many more unacceptable outcomes. Thank You. Congratulations William,on your well deserved award. I have enjoyed your forums at Oshkosh also your many informative articles on this website. Thanks for all. Congratulations William, very well deserved. Even before the award, your name and legacy were already secured in the history of amateur build aircraft. Congratulations, and thank you for your assistance in completing my 601XL-B. Congratulations William, many of us consider you the Corvair Authority. Just read about the award in Sport Aviation. Admittedly, I have not been a fan of auto engines in aircraft, but having spent countless hours reading the information on WW’s site, I can honestly say that I’ve changed my mind and definitely looking at the Corvair engine as a suitable alternative. Congratulations William; you embody the spirit of EAA, if for no more reason that being a teacher and invaluable resource for the homebuilding community.